All-Star center Steven Stamkos has just inked a five-year, $37.5 million contract with the Tampa Bay Lightning. The signing come on the heals of helping the team make a surprising run to the Eastern Conference finals. Both the Lightning general manager Steve Yzerman and Stamkos himself said it was never in doubt that the number 1 overall pick in the 2008 NHL draft would remain with the team, even though the deal took several months to put together and Stamkos was restricted free agent. So what’s the “and More” for our headline, and what does a Great Mailday have to do with a contract signing? The Stamkos deal is not the only thing he inked. Today I received a package from Panini America and inside was this. 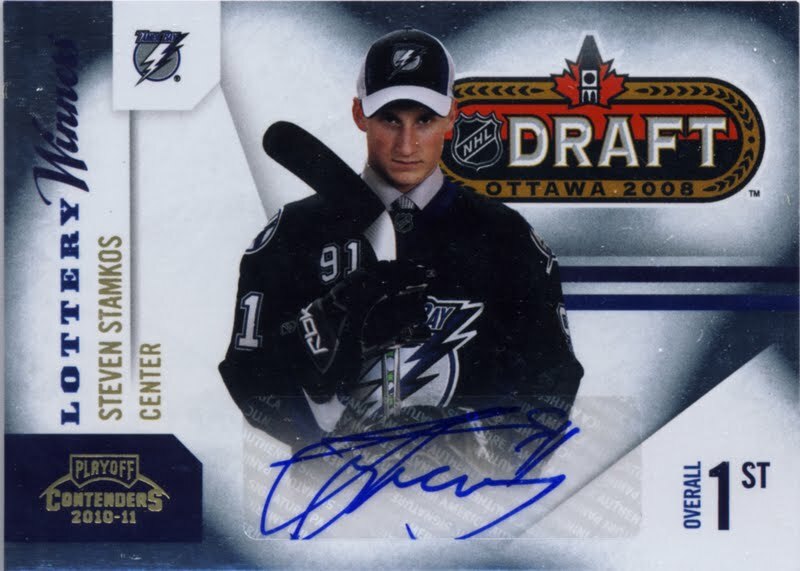 Seems Stamkos has been inking some cards too. This is the redemption card from the box of 2010-11 Panini Playoff Contenders that has now been fulfilled. It’s a super cool card and a great way to enter into the weekend. Thanks Panini!